Northwest National Real Estate: Sale Pending! Remodeled Waterfront Home! Sale Pending! Remodeled Waterfront Home! You will fall in love with this waterfront home in the city limits of Baudette, MN right by the hospital/clinic. This home has been completely remodeled and comes with a full finished basement. 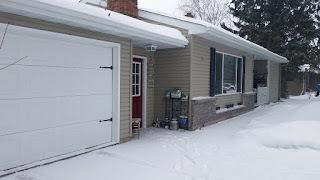 Home has 2 bedrooms, 2 bathrooms, sleeping room, office/den area, wood burning fireplace, central air, laundry chute, custom cabinets and woodwork, deck overlooking Baudette Bay, 1 stall attached garage, and loads of storage. Main floor has 1171 square feet; finished basement has 1148 square feet. New gas water heater installed in November 2015. All this can be yours for $167,000. Call 218-634-2715 to set up a showing.